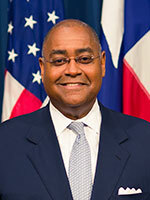 Harris County Precinct 1 Commissioner Rodney Ellis on Monday announced a one-year $10 million commitment to bicycling projects in Houston, in the hopes of jump-starting the city’s transformation into a bike-friendly place. “Working together, we can better leverage scarce resources from governmental entities and the private sector and share our collective expertise to serve the people in this region,” Ellis said. A year after Houston leaders approved an ambitious plan for hundreds of miles of protected, safe bike trails, little progress has been made, something cycling supporters said Ellis’ pledge will change. Officials estimated the money would build at least 50 miles of protected bike lanes considered crucial to providing usable bike access to neighborhoods and jobs. “​This really gives us a boost we needed,” Houston Planning Director Patrick Walsh said. The money, along with city funds from its capital improvement plan, will go toward repainting bike lanes, developing safer intersections and other improvements aimed at making riding a bike in Houston easier and safer. Projects will be chosen for their ability to start soon. Ellis stressed officials have one year to spend the money he committed, and any unspent funds will return to other priorities in his precinct. [Mayor Sylvester] Turner said the funding, along with $1.1 million the city plans to spend in each of the next five years, will act as seed money for upcoming projects, including planned bike lanes along Austin and Caroline and new space for cyclists along Hardy and Elysian on the city’s Near Northside. See here for some background. This is about putting up some money for projects that are already in the pipeline but have been delayed for a variety of reasons. Commissioner Ellis is an avid cyclist himself, so it’s not a surprise to see him make this a priority. Much of his precinct intersects with the city, and as you know I’m delighted to see some county investment in the not-unincorporated territories. I hope the city takes full advantage of this. So where are we on Harvey response? Posted in: Local politics, Planes, Trains, and Automobiles. I think that is great! I am sure his precinct appreciates it. Should say Ellis puts up taxpayers money, it is easy to spend when one does not have to work hard for the money.